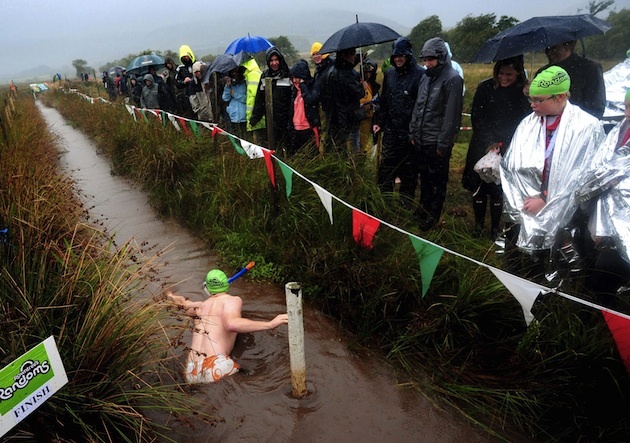 Every year, in a tiny hamlet in Wales, the Bog Snorkelling World Championships draw participants and crowd from all over the world. Take a look inside this decidedly weird—and decidedly welsh—competitive pastime. Every August Bank Holiday, people come from near and far to the Waen Rhydd bog in Wales. 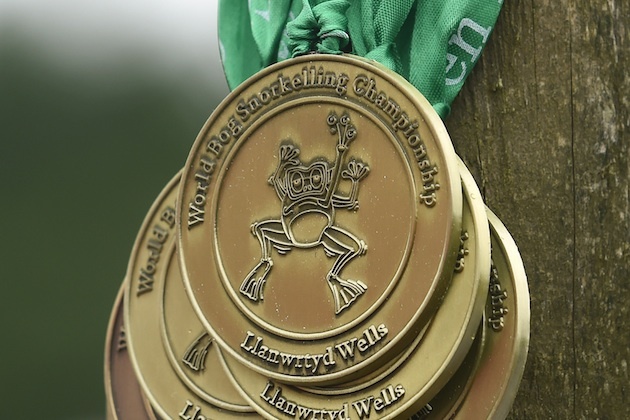 They’re here for the World Bog Snorkelling Championships — an event well outside the mainstream of modern sports, but one that has gained a certain level of global notoriety in recent decades. Newfound attention aside, entrants don’t expect cash prizes or sign lucrative endorsement deals. This is a sport to tax the strength and chill the bone, where motivation lies more in community, camaraderie and unfiltered competition — and perhaps a little taste of something strange — than in any trophy or lasting glory. Most involved hike or bicycle about a mile in from the tiny town of Llanwrtyd Wells (population: 630 hardy souls). And while this particular championship is held annually, there are a number of other oddly themed events that take place locally over the course of the year — from dead of winter to mild summer afternoons. August 30 marked the 30th anniversary of the swampy slough’s swimming. Once again, endurance and epic effort reigned supreme, with more than 150 challengers braving the frigid peat bog on a 60-degree day. The rules are simple: Masks, snorkels, and fins are required, but uni-fin flippers are not permitted. Faces must stay submerged as much as possible and traditional strokes are not allowed. Hence the contestants flutter-kicking and dog-paddling down a 60-yard trench before tapping a wooden post, turning and doing it all over again. The water is cold, rank and murky. Those not participating line the banks and cheer, some in clever costume, most seeming to possess a subtle sense of irony at the absurdity of it all. So why, exactly, would anyone actively choose to indulge in such an eccentric, self-abusing activity? It’s an understandable question, and one that begets even more in turn: What possesses one to participate in bathtub races, or to walk on stilts in a parade? What about the aberrant appeal of running with the bulls? Or those ritualistic polar bear plunges, in which bodies are gleefully submerged in icy water that can paralyze the muscles and still a beating heart? As with any uniquely niche-bound adrenaline fix, the allure of bog snorkelling can’t be singularly defined. For triathletes who train all year in hopes of achieving a new world’s record, the thrill of competition is palpable and pressing. For those those who come to celebrate the collective spirit of absurdity, the appeal is decidedly communal. To these inhabitants of the ancient land of Powys, the fortitude of free enterprise — of doing something different, no matter how wily or weird, for the sake of staking an identity — rings real indeed. Commonly cited as the smallest town in Britain, Llanwrtyd Wells once was celebrated for its sulfur springs, which many believed yielded healing properties. But the popularity of spas and baths declined over the years — as has pony-trekking, the leisure activity propped up to fill the tourism gap. Such were the subjects of debate one evening in 1976, when Gordon Green, then the proprietor of the Neuadd Arms Hotel, took to brainstorming with other locals over pints of ale at the hotel pub. The goal: to think of some way, any way, to trumpet the region's unique topography and history. So it was that competitive bog snorkelling was born — a weird, wholly unique union of nature and competitive zeal that could only have survived and thrived in a place so weird. The advent of bog snorkelling — essentially: the art of propelling down a claustrophobic channel — led to the creation of Green Events, Gordon Green’s eponymous nonprofit organization designed to boost local tourism through myriad off-beat revelries, including Mountain Bike Bog Snorkelling, the Bog Snorkelling Triathlon, Wife-Carrying, Gravy Wrestling, Worm Charming and the Real Ale Wobble. The success of these gonzo challenges led further to the creation of the World Alternative Games, a biannual fortnight of activities not recognized by the Olympics. Looking at the event’s participants, it’s not hard to sympathize with Green’s assessment. 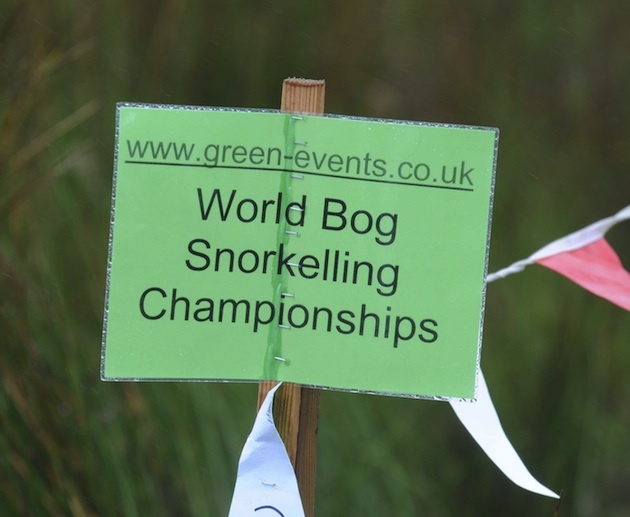 For as much as the event is hewn to a sense of local tradition, bog snorkelling is first and foremost about competition, fun, and frivolity — qualities which, when appropriately marketed, can attract participants from the world over. And so they arrive, from Australia and the Czech Republic, Ireland and France, Germany and Japan, New Zealand and Sweden, the United States and Wales herself. All of them come either to paddle through the glorious stench themselves, or to watch in awe, socialize, and take in a bit of local color. The diversity of contenders and spectators might be at stark odds with the size of the crowds themselves, but when you’re dealing with a sport whose principal aim is to wade through the freezing mud, such metrics aren’t exactly the highest priority. Forget glitz and glamour. This is about people willfully floating in a filthy ditch, where participants can include — as they did this year — Elvis impersonators replete with fins and snorkel. Say what you will about the sporting merits of the thing, but there’s nothing quite like watching a guy in a white leisure suit and cape girding up his loins and striking a stance before disappearing into a pool of black-brown muck. To those who question the level of physical taxation involved in clawing through a pile of grass and sediment, I submit: Imagine doing that with a large green wooden turtle or makeshift dorsal fin strapped to your back. How about angel wings? A superhero costumes? An inflatable fat suit? And what say you of those peerless purists, who who brave the nippy elements with little more than a speed-o and a crustacean’s sense of pain? But while bog snorkelling, with its cowbells and ale and willful self-humiliation, is a decidedly recent phenomenon, it’s defined by a much more timeless relationship to the land — its quiet water, its decaying leaves and sundews, its constant sense of chill. It was Owain Glyndwr’s anarchists who took refuge here in the early 1400s, using marsh reeds to breathe in air as they hid from the King’s soldiers. Celtic people — like Glyndwr and his progeny — can be a mysterious and misunderstood lot: intrinsically linked to the creative spirit, to polytheism and the worship of nature. They are farmers and seamen, technology and tourism workers, poets and shape-shifters. Snorkels may have taken the place of reeds and straws, sports of cultural warfare, spectators the world over of dye-in-the-wool denizens, but there’s a superseding sense that maybe things haven’t really changed all that much. Picture Glyndwr’s bloodied men, beards matted as they slipped silently into the watery troughs, waiting for their unwitting adversaries to appear through the mist. Now replace that image with one of a freckle-faced lass in a nurse/shark costume, conjuring a kick-turn at the end of the bog and heading for home amid the din of banging pie tins and, perchance, a golden medallion. Leeds-hailed Hayden Pitchforth, a certified bog enthusiast, splashed and flailed his way to the 2015 World Champion title with a time of one minute, 26.75 seconds. Pitchforth has been down this watercourse many times before, having also won the world title in 2006. But while his effort was indeed admirable, it still paled — however slightly — to Kristy Johnson’s still — world-record of 1:22.56, set in 2014. Meanwhile, the Junior World Championship (yes, it’s a thing) was won by Megan Davies, with a time of 1:54.84, while Swedish swimmer Eva Jonasson claimed the Ladies (and International) Championship at 1:31.06. Churning through the marl can be a family affair as well. The entire Pitchforth clan, for instance, trains at the historic Batley Sports Centre in West Yorkshire, competing annually in bog snorkelling and underwater hockey. Just last year, daughter Emma turned in a blazing 1:26.81 to become Junior Champion at age 16. Then there’s Emma’s mother, Joanne Pitchforth, crowned champion in 2007. For her, the challenges of her family’s preferred pastime are much greater than the average gawker might realize. Alone beneath the brown water, there’s little to no visibility, its nature-bound ditches only wide enough to let the wet close in like a watery grave. But once the snorkeller accepts her lot, the pinched walls release their grasp — just enough to let her know she’s alone in the melancholy murk. This is bog snorkelling, an immersion as much in competition with others as with oneself. “It’s wacky, it’s wild, it’s wet and it’s really brown,” said one of the women. The holiday weekend has something for everyone with an ale and cider bar on site, crafts, a bouncy castle and more. The fancy dress entries, of which there are more than any reasonable person might think, are something to behold. Anne Marie Beresford-Webb and Eva Walters took first prize this year, competing together as a pantomime unicorn — a celebration of some long-ago faerie spirit. The thrill of victory, the agony of defeat: Both can assume many forms. When ABC’s Wide World of Sports first coined that phrase, all those decades ago, there was no cable television, no Internet and no social media. Yet the show’s seminal programming — imbued as it was by an overarching sense of discovery, journeying to parts unknown in search of personal stories and the drama of competition—managed to include events as obscure as toad racing and log rolling. 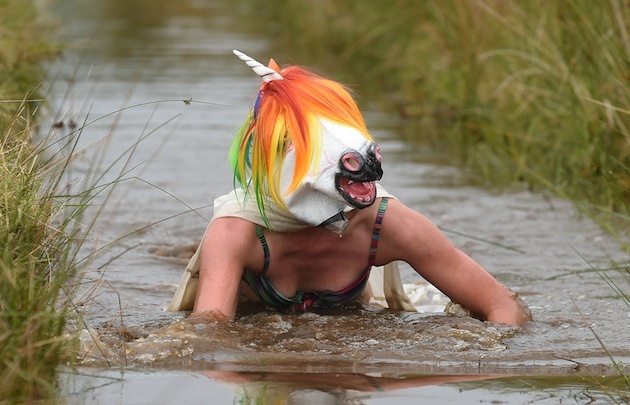 Like many of the strange rituals Howard Cosell profiled all those years ago, bog snorkeling will never bear witness to the insane highs and lows, the excesses or trappings of modern sports. There are no lockouts or doping scandals, no “deflategate” or multimillion dollar ad buys. Not for a day spent on the misty marsh summoning merriment with friends old and new. Advanced stats and analytics will never play a role—particularly when competitors are willing to choose donning bumblebee costumes, aerodynamic advantages be damned. Instead, bog snorkelling can be seen as representing perhaps the simplest and purest of intrepid pursuits: one person alone against the elements, yet surrounded by others, a preternatural sense of kinship — if not in blood, then certainly in some love of the absurd—somehow binding them all. There are still many months before the next Bank Holiday in Wales, when the bogs will once again be filled with the flips and flaps of misplaced human fish. But the Welsh locals intend to keep their weirdo flame alive all the while — bicycle-towed chariot races, stone skimming, the man versus horse marathon, other feats of derring-do that won’t make sports-page ink. Hard as they try, though, none of them will quite compare to wallowing in the mire, with fins, mask and snorkel letting their wearers perchance to dream of greatness. In a peat bog in Wales.